I have some earthshattering news to share with you. I am not an ahead of time teacher, blogger or creator. That's right - I know there are some teachers, bloggers and TPT creators who are working on end of the year units or even Back to School items. I read blog posts weeks ago that were talking about Easter and they had pictures!! I just can't do it. I am a blog as I go kinda person and I realize that sometimes this means I am sharing something and it is too late for you to use it this year - this is one of those times : ( (hopefully you can Pin it or save it for next year!!). On Saturday I shared our Bunny Bucks. When I introduced them to my class on Monday my class was very excited. Then they asked if we were going to do Secret Elf Pals too - only for Easter (since we had done Secret Elf Pals at Christmas time). Here is another nugget about me - I am a sucker for kids asking me to do things or follow traditions. If one kid says, remember last year when you did this, or I loved it when we did this - guess what I do it again, works on me EVERY time!! So guess what, we are doing secret Bunny Pals. 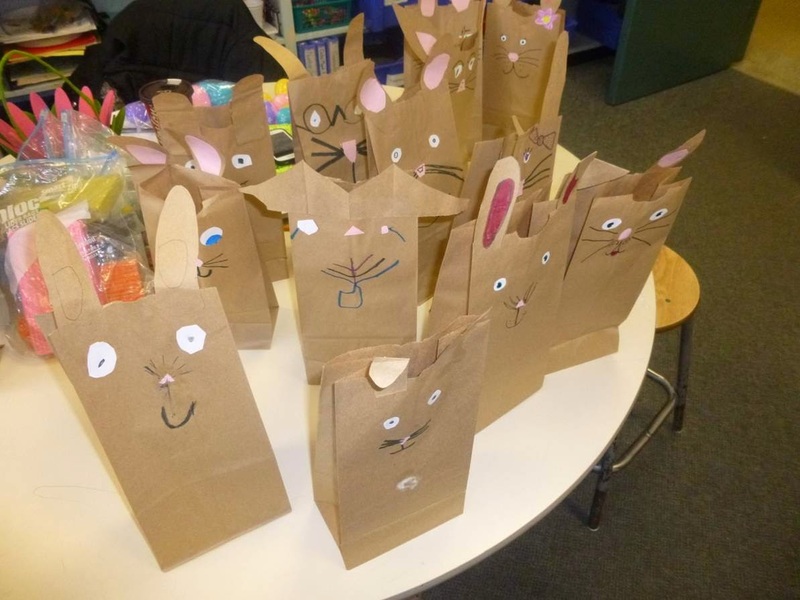 Today we made bunny bags out of lunch bags - I gave each student two bags (I have over 1000 bags). They wrote their name on the back of one. Cut ears out of the other one. Attached the ears and used scraps of pink and white for detail. 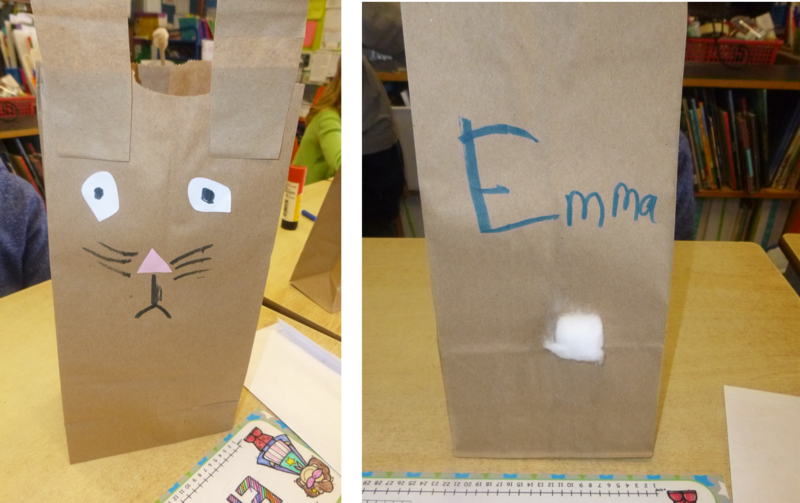 I gave them each a cotton ball for the tail. Then we moved on to Task 2. Then the wrote 2 eggs-ellent compliments for their pal. They cut out the eggs and put them in the plastic dollar store eggs and dropped them in the bag. They could of course have just cut the eggs out and dropped them in - but I may have a slight obsession with dollar store plastic eggs. Students will be using their bunny bucks to buy an item for their pal at our class store at the end of the month - since we started late (cause I had no plans of doing this till the guilt got me) we will be doing it over the next week and a half. If you want to do Bunny Pals in your classroom (the rest of the month or next year) click on the picture below to pick up a copy of the task cards. Sorry - really it is a goal of mine to share things ahead of time so you can use them - but it is a long term goal, not a short term goal! 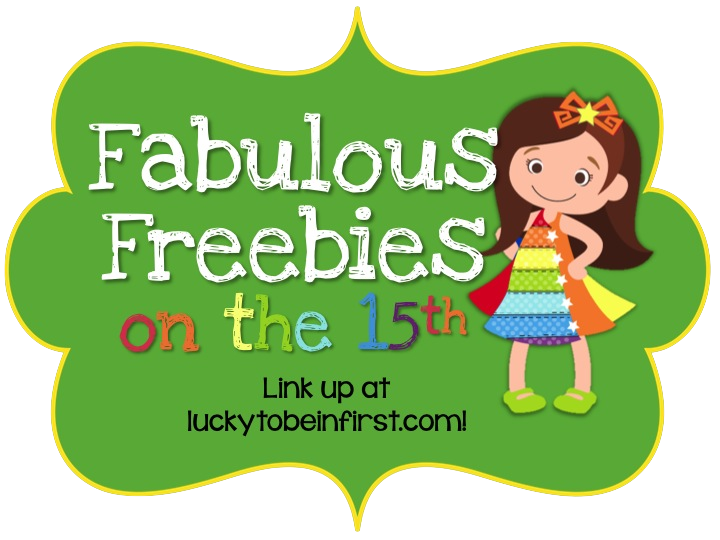 I am linking up with my friend Molly at Lucky to Be in First for her Fabulous Freebies on the 15th (or 16th) linky!! We might be long-lost twins...I am sort of a 'do it right before the holiday' kind of girl! As in, only about two kids will finish their (your) Easter Bunny assistant letters before Easter. With our music rehearsal/performance this week, and Good Friday off, it just isn't going to happen. And then it is Earth Day, but we have a field trip that day, so add both of those to our ever-growing list of unfinished projects! How cute!! And I definitely know how it is to fly by the seat of your pants... You are NOT the only one!